NFFE-IAM National President William R. Dougan, center, accepts the Theodore Roosevelt Award from Office of Personnel Management Director Beth Cobert, right, and Deputy Director Andrew Maycock, left. 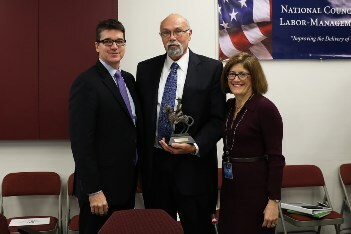 National Federation of Federal Employees (NFFE-IAM) National President William R. Dougan has been awarded the prestigious Theodore Roosevelt Award, the Office of Personnel Management’s highest honor, given to those who are courageous in defense of our nation’s merit principles. Dougan was presented the award by Office of Personnel Management (OPM) Director Beth Cobert and Office of Management and Budget (OMB) Deputy Director for Management Andrew Mayock, who praised Dougan for his outstanding work on the National Council on Federal Labor-Management Relations and for his fierce advocacy of civil service federal employees. Dougan received this award one month from his retirement from a combined 39-year career as a federal employee and federal Union leader. “Bill exemplifies the leadership that this award embodies,” said NFFE National Secretary-Treasurer-elect Dave Stamey. “Bill makes every day into a day to advocate for the principles this award represents”.